There are just three things you need for growing lemons in your home garden. not only allow you to grow lemons successfully, but will apply to similar citrus fruits such as limes, mandarins and kumquats. Why are we growing lemons in a vegetable garden website? Well, what kitchen garden can be considered complete without a lemon tree growing... and some veggies and salads just have to have lemon juice squeezed over them... absolutely have to. Right, that's settled. So give your lemon tree, or other young citrus trees, a good start and plant them in the early autumn or early spring to spare them difficult climate conditions. 1) Sunshine. This is the most essential for how to grow lemons successfully. They need a minimum of six hours of full sun every day. This goes for all types of citrus trees and is not negotiable. If there isn't an obvious sunny spot in your garden, grow a container variety and move it around. It simply must get this level of sunshine to thrive. Citrus trees need a warm or mild climate zone. As long as frosts are not severe citrus trees will tolerate cool conditions. In cold zones, grow only container versions and bring them inside a greenhouse or enclosed porch when it gets really cold. 2) Great drainage. Lemon trees love to have lots of water but absolutely hate to sit in it. So don't put them anywhere near the boggy part of the yard, if you have one. If you can't identify a good spot with lots of sunshine, again, consider putting your lemon tree into a pot. There are container varieties that will thrive under the proper conditions. Those conditions include having enough room to grow, lots of water and re-potting every few years. Use the no dig methods of layering materials even in containers to achieve brilliant results. Ensure a good level of mulch around your tree but keep the mulch 5-7cm (2-3") away from the base. Mulch will hold moisture but will encourage rot if allowed to touch the tree trunk. 3) Attention. If you are growing lemons, or any sort of citrus, they need a level of attention to perform for you. Water them regularly, about once a week in hot weather. Feed them fertiliser often (at the drip line, rather than near the trunk) and keep an eye on them. Citrus trees attract pests and they need to be controlled. Aphids are attracted for the new foliage. A quick review of pest controls at garden pests will limit the damage they do. The same controls should be used for citrus leafminer. This is the larvae of a moth and telltale signs are a silvery trail as they eat their way through the leaf. Finally, scale is also common. 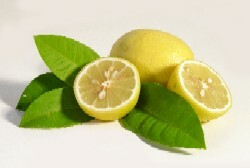 If your lemon tree develops scale, water more often and use a vegetable oil based solution for pest control. If your fruit starts to drop before it is mature, it is generally a sign of irregular or uneven watering. Lack of fertiliser or too much can also cause this problem. As discussed, they like your attention. They'll tell you if something isn't right. If you can meet these three conditions, growing lemons or other citrus will be a rewarding pleasure for you.